Cybercriminals continue to actively launch maliciuos and fraudulent malware-serving campaigns further spreading malicious software potentially compromising the confidentiality availability and integrity of hte targeted host to a multit-tude of malicious software further spreading malicious software while earning fraudulent revenue in the process of monetizing access to malware-infected hosts. We've recently intercepted a currently active portfolio of rogue/fake/ PornTube malicious and fraudulent domains, with the cybercriminals behind the campaign earning fraudulent revenue largely relying on the utilization of an affiliate-network based revenue-sharing scheme. In this post we'll profile the campaign, provide actionable intelligence on the infrastructure behind it, and discuss in-depth the tactics techniques and procedures of the cybercriminals behind it. We'll continue monitoring the campaign and post updates as soon as new developments take place. Cybercriminals continue actively launching fraudulent and malicious blackhat SEO campaigns further acquiring legitimate traffic for the purpose of converting it into malware-infected hosts further spreading malicious software potentially compromising the confidentiality availability and integrity of the targeted host to a multi-tude of malicious software. We've recently intercepted a currently active malicious blackhat SEO campaign serving scareware to socially engineered users with the cybercriminals behind it earning fraudulent revenue largely relying on the utilization of an affiliate-network based revenue-sharing scheme. Cybercriminals continue actively speading fraudulent and malicious campaigns potentially targeting the confidentiality availability and integrity of the targeted host to a multi-tude of malicious software further earning fraudulent revenue in the process of monetizing access to malware-infected hosts further spreading malicious and fraudulent campaigns potentially affecting hundreds of thousands of users globally. We've recently came across to a currently active diversified portfolio of pharmaceutical scams with the cybercriminals behind it successfully earning fraudulent revenue in the process of monetizing access to malware-infected hosts including the active utilization of an affiliate-network based type of revenue sharing scheme. In this post we'll profile the campaign, provide actionable intelligence, on the infrastructure behind it, and discuss in depth, the tactics techniques and procedures of the cybercriminals behind it. Cybercriminals continue actively spreading malicious software while looking for alternative ways to acquire and monetize legitimate traffic successfully earning fraudulent revenue in the process of spreading malicious software. We've recently came across to a Google Sponsored scareware campaign successfully enticing users into installing fake security software on their hosts further earning fraudulent revenue in the process of monetizing access to malware-infected hosts largely relying on the utilization of an affiliate-network based type of revenue sharing scheme. In this post we'll profile the campaign, provide actionable intelligence, on the infrastructure, behind it and discuss in-depth, the tactics techniques and procedures of the cybercriminals behind it. Cybercriminals, continue, actively, launching, malicious, and, fraudulent, campaigns, further, spreading, malicious, software, potentially, exposing, the, confidentiality, availability, and, integrity, of, the, targeted, host, to, a, multi-tude, of, malicious, software. In, this, post, we'll, profile, a, currently, active, portfolio, of, fake, security, software, and, discuss, in-depth, the, tactics, techniques, and, procedures, of, the, cybercriminals, behind, it. We'll, continue, monitoring, the, campaign, and, post, updates, as, soon, as, new, developments, take, place. Shall we expose a huge domains portfolio of fake/rogue video codecs dropping the same Zlob variant on each and every of the domains, thereby acting as a great example of what malicious economies of scale means? Why are the malicious parties so KISS oriented at the end of every campaign, compared to the complexity and tactical warfare tricking automated malware harvesting approaches within the beginning of the campaign? Because they're not even considering the possibility of proactively detecting the end of many other malware campaigns to come, which will inevitable be ending up to these domains. With, the, rise, of, Web, malware, exploitation, kits, continuing, to, proliferate, cybercriminals, are, poised, to, continue, earning, fraudulent, revenue, in, the, process, of, monetizing, access, to, malware-infected, hosts, largely, relying, on, the, active,y utilization, of, client-side, exploits, further, spreaing, malicious, software, potentially, compromising, the, confidentiality, availability, and, integrity, of, the, targeted, host, to, a, multi-tude, of, malicious, software. What, used, to, be, an, ecosystem, dominated, by, proprietary, DIY (do-it-yourself) malware and exploits, generating, tools, is, today's, modern, cybercrime, ecosystem, dominated, by, Web, malware, exploitation, kits, successfully, empowering, novice, cybercriminals, with, the, necessary, tactics, techniques, and, procedures, for, the, purpose, of, launching, a, fraudulent, and, malicious, campaign, potentially, affecting, hundreds, of, thousands, of, users, globally. In, this, post, we'll, provide, actionable, intelligence, on, currently, active, IcePack, Web, malware, exploitation, kit, client-side, and, malware-exploits, serving, domains. We'll, continue, monitoring, the, campaigns, and, post, updates, as, soon, as, new, developments, take, place. 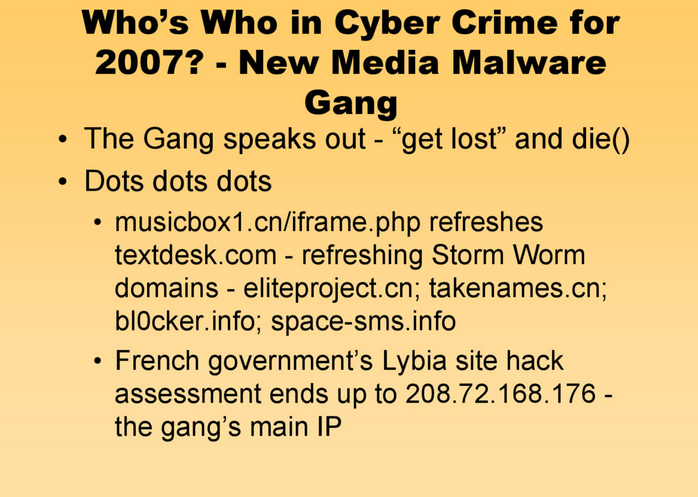 Remember, the, Russian, Business, Network, and, the, New, Media, Malware, Gang? It's, been, several, years, since, I, last, posted, an, update, regarding, the, group's, activities, including, the, direct, establishing, of, a, direct, connection, between, the, Russian, Business, Network, the, New, Media, Malware, gang, including, a, variety, of, high, profile, Web, site, compromise, campaigns. What's, particularly, interesting, about, the, group's, activities, is, the, fact, that, back, in, 2007, the, group's, activities, used, to, dominate, the, threat, landscape, in, a, targeted, fashion, including, the, active, utilization, of, client-side, exploits, and, the, active, exploitation, of, legitimate, Web, sites, successfully, positioning, the, group, including, the, Russian, Business, Network, as, a, leading, provider, of, malicious, activities, online, leading, to, a, series, of, analyses, successfully, detailing, the, activities, of, the, group, including, the, direct, establishing, of, a, connection, between, the, New, Media, Malware, Gang, the, Russian, Business, Network, and, the, Storm, Worm, botnet. In, this, post, I'll, provide, a, detailed, analysis, of, the, group's, activities, discuss, in, the, depth, the, tactics, techniques, and, procedures, (TTPs), of, the, group, including, a, direct, establishing, of, a, connection, between, the, New, Media, Malware, Gang, the, Russian, Business, Network, and, the, direct, compromise, of, a, series, of, high, profile, Web, site, compromise, campaigns. Having, successfully, tracked, down, and, profiled, the, group's, activities, for, a, period, of, several, years, and, based, on, the, actionable, intelligence, provided, regarding, the, group's, activities, we, can, easily, establish, a, direct, connection, between, the, New, Media, Malware, Gang, and, the, Russian, Business, Network, including, a, series, of, high, profile, Web, site, compromise, campaigns. 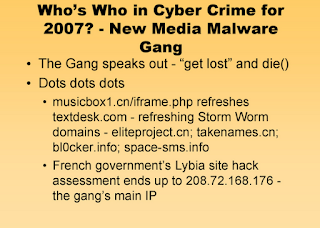 Let's, profile, the, group's, activities, including, a, direct, establishing, of, a, connection, between, the, Russian, Business, Network, the, New, Media, Malware, Gang, and, the, Storm, Worm, botnet. In, 2007, I, profiled, the, direct, compromise, of, the, Syrian, Embassy, in, London, including, a, related, compromise of, the, USAID.gov compromised, malware and exploits served, the, U.S Consulate St. Petersburg Serving Malware, Bank of India Serving Malware, French Embassy in Libya Serving Malware, Ethiopian Embassy in Washington D.C Serving Malware, Embassy of India in Spain Serving Malware, Azerbaijanian Embassies in Pakistan and Hungary Serving Malware, further, detailing, the, malicious, activities, of, the, Russian, Business, Network, and, the, New, Media, Malware, Gang. 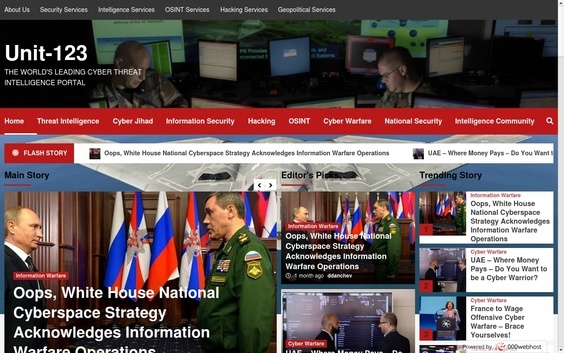 Let's profile, the, campaigns, and, discuss, in, depth, the, direct, connection, between, the, group's, activities, the, Russian, Business, Network, and, the, New, Media, Malware, Gang. sicil.info - on 2007-09-26 during the time of the attack, the domain was registered using the srvs4you@gmail.com email. The domain name first appeared online on 2006-06-10 with an IP 213.186.33.24. On 2007-07-11, it changed IPs to 203.121.79.71, followed by another change on 2008-01-06 to 202.75.38.150, another change on 2008-05-06 to 203.186.128.154, yet another change on 2008-05-18 to 190.183.63.103, and yet another change on 2008-07-27 to 190.183.63.56. On 2008-09-25 0ki.ru was registered using the kseninkopetr@nm.ru email. The same email address is not known to have been used to register any additional domains. On 2008-06-19 x12345.org was registered using the xix.x12345@yahoo.com email. On 2007-09-10 the domain use to respond to 66.36.243.97, then on 2007-11-13 it changed IPs to 58.65.236.10, following another change on 2008-05-06 to 203.186.128.154. No other domains are known to have been registered using the same email address. On 2007-06-07, miron555.org was registered using the mironbot@gmail.com email, followed by another registration email change on 2008-02-12 to nepishite555suda@gmail.com. On 2007-04-24, the domain responded to 75.126.4.163. It then changed IPs on 2007-05-09 to 203.121.71.165, followed by another change on 2007-06-08 to 58.65.239.247, yet another change on 2007-07-15 to 58.65.239.10, another change on 2007-08-19 to 58.65.239.66, more IP changes on 2007-09-03 to 217.170.77.210, and yet another change on 2007-09-18 to 88.255.90.138. In, 2008, I, profiled, the, direct, compromise, of, The Dutch Embassy in Moscow Serving Malware, further, detailing, the, malicious, and, activity, of, the, Russian, Business, Network, and, the, New, Media, Malware, Gang. Let's, profile, the, campaign, and, discuss, in-depth, the, direct, connection, between, the, group's, activities, and, the, direct, compromise, of, the, Embassy's Web, site. On 2009-03-04, lmifsp.com was registered using the redemption@snapnames.com email. On 2007-11-30, it used to respond to 68.178.194.64, then on 2008-12-01 it changed IPs to 68.178.232.99. In, 2008, I, profiled, the, direct, compromise, of, Embassy of Brazil in India Compromised, further, establishing, a, direct, connection, between, the, group's, activities, and, the, Russian, Business, Network. Let's, profile, the, campaign, and, discuss, in-depth, the, direct, connection, between, the, group's, activities, and, the, Russian, Business, Network. On 2008-10-15, traff.asia was registered using the traffon@gmail.com email. On 2008-06-19, google-analyze.com was registered using the incremental@list.ru email. 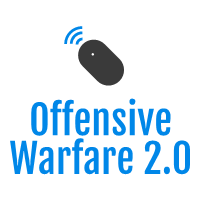 On 2007-12-21 it responded to 66.36.241.153, then it changed IPs on 2007-12-22 to 66.36.231.94, followed by another change on 2008-02-03 to 79.135.166.74, then to 195.5.116.251 on 2008-03-16, to 70.84.133.34 on 2008-07-31, followed by yet another change to 216.195.59.77 on 2008-09-15. On 2008-08-05, google-analystic.net, is, known, to, have, responded, to, 212.117.163.162, and, was registered using the abusecentre@gmail.com email. On 2008-04-11 it used to respond to 64.28.187.84, it then changed IPS to 85.255.120.195 on 2008-08-03, followed by another change on 2008-08-10 to 85.255.120.194, then to 85.255.120.197 on 2008-09-07, to 69.50.161.117 on 2008-09-14, then to 66.98.145.18 on 2008-10-11, followed by another change on 2008-10-25 to 209.160.67.56. On 2008-11-11, beshragos.com was registered using the migejosh@yahoo.com email. On 2008-11-11 it used to respond to 79.135.187.38. In, 2009, I, profiled, the, direct, compromise, of, Ethiopian Embassy in Washington D.C Serving Malware, further, detailing, the, group's, activities, further, establishing, a, direct, connection, between, the, group's, activities, and, the, Russian, Business, Network. On 2009-01-19, 1tvv.com is, known, to, have, responded, to, 69.172.201.153; 66.96.161.140; 122.10.52.139; 122.10.18.138; 67.229.44.15; 74.200.250.130; 69.170.135.92; 64.74.223.38, and, was registered using the mogensen@fontdrift.com email. On 2005-08-27, the domain (1tvv.com) is, known, to, have, responded to 198.65.115.93, then on 2006-05-12 to 204.13.161.31, with yet another IP change on 2010-04-08 to 216.240.187.145, followed by yet another change on 2010-06-02 to 69.43.160.145, then on 2010-07-25 to 69.43.160.145. On 2010-01-04, trafficinc.ru was registered using the auction@r01.ru email. On 2009-03-01, trafficmonsterinc.ru was registered using the trafficmonsterinc.ru@r01-service.ru email. On 2009-05-02, us18.ru, is, known, to, have, responded, to, 109.70.26.37; 185.12.92.229; 109.70.26.36, and, was registered using the belyaev_andrey@inbox.ru email. In, 2009, I, profiled, the, direct, compromise, of Embassy of India in Spain Serving Malware, further, detailing, the, malicious, activity, further, establishing, a, direct, connection, between, the, group's, activities, and, the, Russian, Business, Network. On 2008-09-07, msn-analytics.net was registered using the palfreycrossvw@gmail.com email. On 2007-06-17 it used to respond to 82.98.235.50, it then changed IPs on 2008-09-07 to 58.65.234.9, followed by another change on 2009-11-14 to 96.9.183.149, then to 96.9.158.41 on 2009-12-29, and to 85.249.229.195 on 2010-03-09. On 2008-07-10, pinoc.org was registered using the 4ykakabra@gmail.com email. On 2008-07-10 it responded to 58.65.234.9, it then changed IPs on 2008-08-17 to 91.203.92.13, followed by another change on 2008-08-24 to 58.65.234.9, followed by yet another change to 208.73.210.76 on 2009-10-03, and yet another change on 2009-10-06 to 96.9.186.245. On 2008-09-20, wsxhost.net was registered using the palfreycrossvw@gmail.com email. On 2008-09-20 wsxhost.net responded to 58.65.234.9, it then changed IPs on 2008-12-22 to 202.73.57.6, followed by another change on 2009-05-18 to 202.73.57.11, yet another change on 2009-06-22 to 92.38.0.66, then to 91.212.198.116 on 2009-07-06, yet another change on 2009-08-17 to 210.51.187.45, then to 210.51.166.239 on 2009-08-25, and finally to 213.163.89.54 on 2009-09-05. On 2008-06-29 google-analyze.cn was registered using the johnvernet@gmail.com email. On 2008-08-27, yahoo-analytics.net was registered using the fuadrenalray@gmail.com email. - google-analyze.org - Email: johnvernet@gmail.com - on, 2008-07-09, google-analyze.org , is, known, to, have, responded, to, 58.65.234.9, followed, by, a, hosting, change, on, 2008-08-17, with, google-analyze.org, responding, to, 91.203.92.13, followed, by, another, hosting, change, on, 2008-08-24, with, google-analyze.org, responding, to, 202.73.57.6. - qwehost.com - Email: 4ykakabra@gmail.com - on, 2009-05-18, qwehost.com, is, known, to, have, responded, to, 202.73.57.11, followed, by, a, hosting, change, to, 202.73.57.11, followed, by, another, hosting, change, on, 2009-06-22, pointing, to, 92.38.0.66, followed, by, yet, another, hosting, change, pointing, to, 91.212.198.116, followed, by, yet, another, hosting, change, on, 2009-08-17, pointing, to, 210.51.187.45. - zxchost.com - Email: 4ykakabra@gmail.com - on, 2009-03-02, zxchost.com, is, known, to, have, responded, to, 202.73.57.6, followed, by, a, hosting, change, on, 2009-05-18, pointing, to, 202.73.57.11, followed, by, yet, another, hosting, change, on, 2009-06-22, pointing, to, 92.38.0.66, followed, by, yet, another, hosting, change, on, 2009-08-25, pointing, to, 210.51.166.239. - odile-marco.com - Email: OdileMarcotte@gmail.com - on, 2009-05-18, odile-marco.com, is, known, to, have, responded, to, 202.73.57.6, followed, by, a, hosting, change, on, 2009-06-22, pointing, to, 202.73.57.11, followed, by, yet, another, hosting, change, on, 2009-07-06, pointing, to, 92.38.0.66, followed, by, yet, another, hosting, change, on, 2009-08-17, pointing, to, 91.212.198.116. - edcomparison.com - Email: johnvernet@gmail.com - on, 2009-05-18, edcomparison.com, is, known, to, have, responded, to, 202.73.57.6, followed, by, a, hosting, change, on, 2009-06-22, pointing, to, 202.73.57.11, followed, by, yet, another, hosting, change, on, 2009-07-13, this, time, pointing, to, 92.38.0.66, followed, by, yet, another, hosting, change, on, 2009-08-17, this, time, pointing, to, 210.51.187.45. - fuadrenal.com - Email: fuadrenalRay@gmail.com - on, 2009-01-26, fuadrenal.com, is, known, to, have, responded, to, 202.73.57.6, followed, by, a, hosting, change, on, 2009-05-18, pointing, to, 202.73.57.11, followed, by, yet, another, hosting, change, on, 2009-07-13, this, time, pointing, to, 91.212.198.116, followed, by, yet, another, hosting, change, on, 2009-08-17, this, time, pointing, to, 91.212.198.116. - rx-white.com - Email: johnvernet@gmail.com - on, 2009-05-18, rx-white.com, is, known, to, have, responded, to, 202.73.57.6, followed, by, a, hosting, change, on, 2009-06-22, pointing, to, 202.73.57.11, followed, by, yet, another, hosting, change, on, 2009-07-06, this, time, pointing, to, 92.38.0.66, followed, by, yet, another, hosting, change, on, 2009-08-17, this, time, pointing, to, 91.212.198.116. In, 2009, I, profiled, the, direct, compromise, of, Embassy of Portugal in India Serving Malware, further, establishing, a, direct, connection, between, the, group's, activities, and, the, Russian, Business, Network. On, 2009-03-30, ntkrnlpa.info, is, known, to, have, responded, to, 83.68.16.6. Related, domains, known, to, have, participated, in, the, same, campaign - betstarwager.cn; ntkrnlpa.cn. 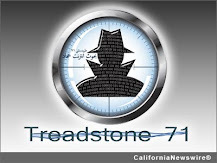 In, 2007, I, profiled, the, direct, compromise, of, French Embassy in Libya Serving Malware, further, establishing, a, direct, connection, between, the, group's, activities, and, the, Russian, Business, Network. On, 2007-02-18, winhex.org, used, to, respond, to, 195.189.247.56, followed, by, a, hosting, change, on, 2007-03-03, pointing, to, 89.108.85.97, followed, by, yet, another, hosting, change, on, 2007-04-29, this, time, pointing, to, 203.121.71.165, followed, by, yet, another, hosting, change, on, 2007-08-19, this, time, pointing, to, 69.41.162.77. On, 2007-11-23, kjlksjwflk.com (Email: sflgjlkj45@yahoo.com), used, to, respond, to, 58.65.239.114, followed, by, a, hosting, change, on, 2009-02-16, pointing, to, 38.117.90.45, followed, by, yet, another, hosting, change, on, 2009-03-09, this, time, pointing, to, 216.188.26.235. In, 2009, I, profiled, the, direct, compromise, of, Azerbaijanian Embassies in Pakistan and Hungary Serving Malware, further, establishing, a, direct, connection, between, the, group's, activities, and, the, Russian, Business, Network. In, 2009, I, profiled, the, direct, compromise, of, USAID.gov compromised, malware and exploits served, further, establishing, a, direct, connection, between, the, gang's, activities, and, the, New, Media, Malware, Gang. In, 2007, I, profiled, the, direct, compromise, of, U.S Consulate St. Petersburg Serving Malware, further, establishing, a, direct, connection, between, the, group's, activities, and, the, Russian, Business, Network. On, 2007-08-31, verymonkey.com (Email: srvs4you@gmail.com), used, to, respond, to, 212.175.23.114, followed, by, a, hosting, change, on, 2007-09-07, pointing, to, 209.123.181.185, followed, by, yet, another, hosting, change, on, 2007-09-27, this, time, pointing, to, 88.255.90.50, followed, by, yet, another, hosting, change, on, 2008-11-11, this, time, pointing, to, 216.188.26.235. What's, particularly, interested, about, the, gang's, activities, is, the, fact, that, back, in 2007, the, group, pioneered, for, the, first, time, the, utilization, of, Web, malware, exploitation, kits, further, utilizing, the, infrastructure, of, the, Russian, Business, Network, successfully, launching, a, multi-tude, of, malicious, campaigns, further, spreading, malicious, software, further, utilizing, the, infrastructure, of, the, Russian, Business, Network.